Elder law attorneys should understand the medical importance that sense of purpose and meaning plays in the lives of older people. A growing body of medical research supports the thesis that older adults who feel that their lives have purpose live longer and have a higher quality of life than older adults who do not feel that way. 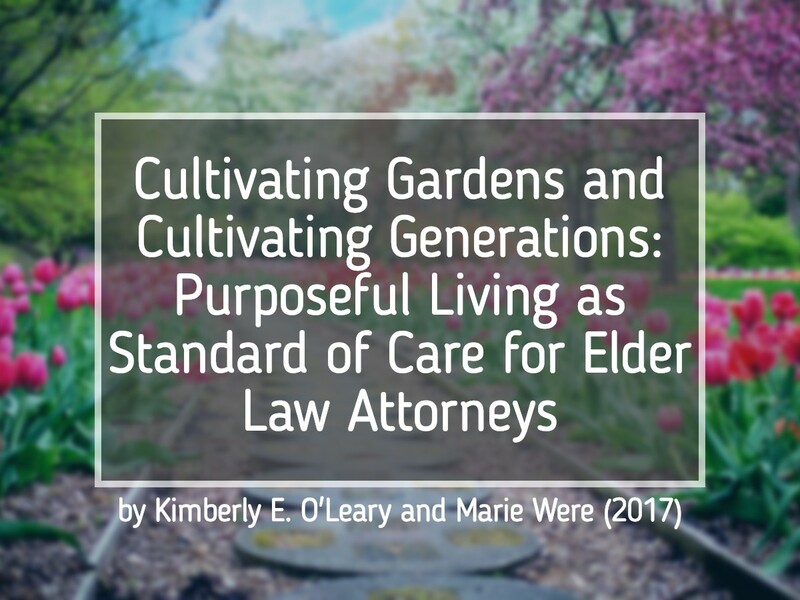 Attorneys who represent older adults can and should incorporate questions about the ability of their clients to pursue activities that give their lives meaning and purpose into their law practices. This focus can occur in individual representation or in larger policy-making, especially surrounding care of the most vulnerable. Rather than focusing solely on procedural protections for clients, attorneys should also focus on whether clients can pursue goals that give their lives meaning or, by contrast, are prevented from doing so. Similarly, policy-makers should look for ways to incorporate the attainment of purposeful goals into programs for older adults, especially residence-care homes. Meaning and purpose have strong cultural roots for many older adults, and programs that foster opportunities for them to achieve meaningful goals must be culturally specific. One such program, to create a Maori care home that incorporates the well-being of the whare, is an example of how one might incorporate purpose in a culturally-specific manner. Kimberly E. O’Leary is a Professor of Law at Western Michigan University-Cooley Law School in Lansing, Michigan, U.S.A. She directs the Sixty Plus, Inc. Elderlaw Clinic. The authors thank Rita Marsala and Matthew Andres for their comments; all errors are the authors’ alone. Marie Were is a descendant of Ngati Manawa and Ngai Te Rangi iwi (Tribes). She teaches law and manages an undergraduate Diploma in Law at Te Piringa Faculty of Law at the University of Waikato, Hamilton, Aotearoa New Zealand.